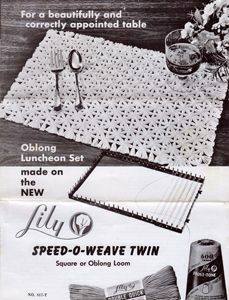 This instruction leaflet came with the square/rectangular Lily Speed-O-Weave looms and contains full instructions on using the loom to make basic rectangular and square mats, with specific instructions for making a set of rectangular place mats. For instructions on making fancy weaves, see booklets 85s and 95s. Copyright Sarah Bradberry, 22nd June 2014. All rights reserved.